This update brings you the new Magnify feature, which allows you to “magnify” an area that you can’t normally ALT Zoom on. 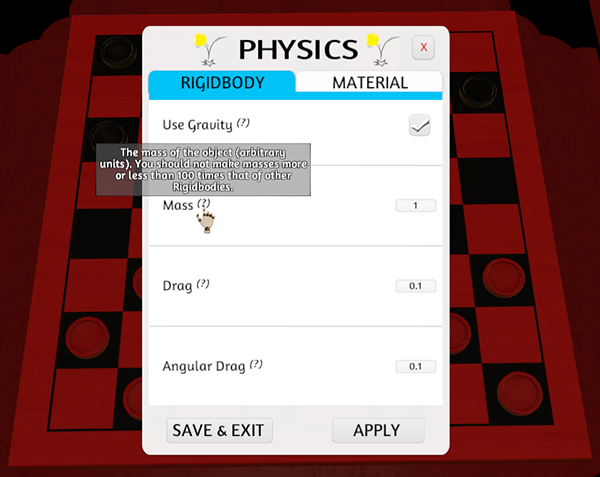 If you created a small board with rules on it and you find it’s hard to see without really zooming in, now you can press M to magnify the board for you. Just remember that it’s different from ALT Zoom, so it will depend on where your camera is facing. As we’re getting closer to release, we are really working on cleaning things up and removing all the old UI, so you’ll see a lot of that going on as we get down to the wire. We have a thread up on our sub-reddit where you can post your last minute suggestions and improvements that you’d like to see before release. Tabletop Simulator is still on sale for 25% at the Humble Store for 1 more week! You can purchase both the individual copy and 4-pack at the discounted rate on our website. Holding the ‘M’ key will magnify a rectangle around your pointer. Works great for reading small text on a board or just giving you a closer look at the action. While holding ‘M’ to magnify using the scroll wheel will control the zoom level just like ALT Zoom. Tweaked card physics so they no longer flip easily when picking up overlapping cards. 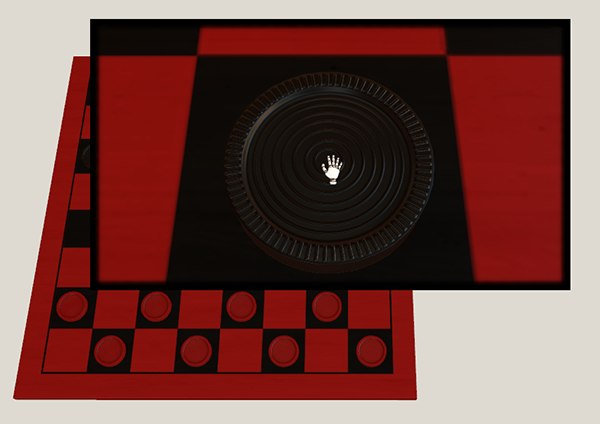 Lowered the center of mass on the player pawns to reduce chance of it toppling over. 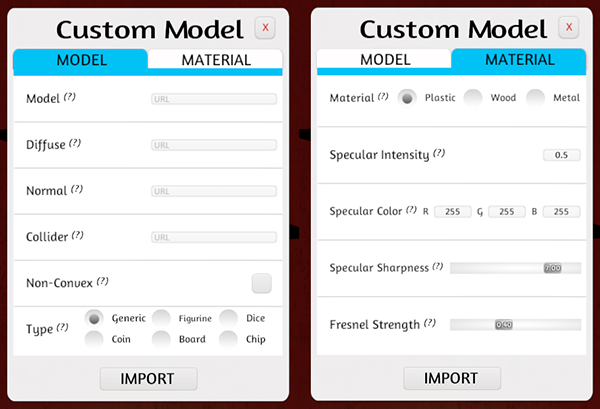 Overhauled the custom model import menu to use the latest UI system. You can now easily control the shader of your custom objects right from the import menu. Shader options are Specular Intensity, Specular Color, Specular Sharpness, Fresnel Strength. Lowered the default shininess of the wood custom objects. Added tooltips explaining every option on the import menu. Added question mark next to any UI element you can mouse over to get more info. Tooltips now have a dark translucent background to make it easier to read especially on the white UI. Text on the tooltips now also word wrap to keep them from being one massive single line. Added tooltips to the graphical and grid menus. Increased the size of the tooltip text. Increased the size of the object teleport bounds to leave more room. Nerfed the teleport effect when holding an object very far away from the table. Toggle zoom now works on the mouse bounds. Fixed (Maybe) the problem where clients couldn’t alt zoom on servers that had objects clipping the teleport bounds. Added “would you like to play the tutorial” message when starting the game up for the first time. Added a shuffle button to the contextual menu for decks of cards. Changed how the contextual menu highlights to be more consistent with how windows works. Custom figurine is no longer destroyed if you cancel the import menu. Fixed invalid password causing you to connect to the server through the proxy just to be kicked. Fixed issues with people being stuck in a lobby on Steam if kicked. Fixed the 2 card deck bug when trying to import the same face image on multiple decks of cards. Fixed being able to change colors in hotseat. Fixed alt zoom text of a previous notecard displaying incorrectly. Fixed bug that caused card backs to be slightly darker than their faces. Fixed tab bug that caused issues when selecting tabs with multiple menus open. Fixed some text fields being slightly blurry. Fixed mipmap bias not being properly applied depending on graphics settings. Fixed inconsistent text sizes on the new tab menus.